Elvis Presley was not what you would call a healthy eater. He reportedly loved bacon-wrapped meatballs, burgers, chicken-fried steak, fried pickles, pound cake, and of course, his signature PBBB sandwich, which took peanut butter, bacon, and banana and smashed them between two slices of white bread. In honor of The King's favorite food, The Takeout decided to try the PBBB out for themselves. Although some may recoil at this artery-clogging concoction, the food news site gave the sandwich a big thumbs up, citing its balance of sweet and salty flavors and smooth and crunchy textures as major selling points. 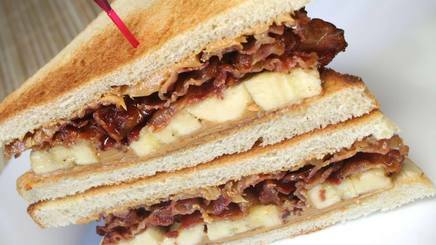 What Did Elvis Presley's Famous Peanut Butter-Bacon-Banana Sandwich Taste Like? Try It for Yourself! !